So I’ve recently started a new job as digital content producer for the Blues rugby team, trying my darndest to make the team look good even when they’re not playing particularly well. Although we got the win against the Western Force, it wasn’t an overly convincing one – not like this beer that was waiting for me when I got home that night. Blurb on the bottle: This smooth ale is brewed with Canterbury Ale Malts, Nelson Hops and Beech Honeydew from the Southern Alps. It is slowly fermented out to give a subtle sweetness, leaving a honey note edge on the palette. My dad always taught me that the best-tasting beers are ones that you earn after a hard day’s work. 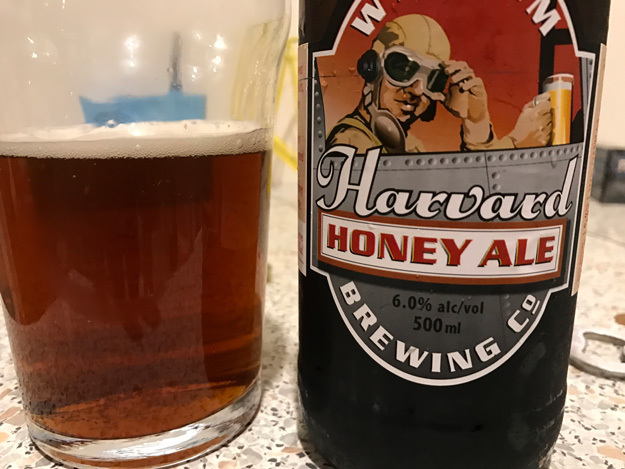 But Wigram Brewing’s Harvard Honey Ale is better than that. It tastes of sweet malt and sticky honey that lingers long after you’ve already swallowed (my apologies if that sounds a bit dirty – it’s been a long day and I need some rest). It’s a mellow beer, sweet and slightly syrupy. If you’re worried that the honey might be overwhelming, don’t be. It’s ever present, yet strangle subtle. Take it from me – I don’t even like honey that much, but I thoroughly enjoyed this beer. Beer/movie combination: Let me think about some honey-related movies… um, I can’t recommend you watch the animated Bee Movie, because it sux. Same with Honey, I Shrunk the Kids and Honey, I Blew Up the Kid. Then there’s a movie called Honey that I haven’t seen, but it stars Jessica Alba, so it’s probably not any good.